I should be writing this post while wearing my trendy new, wannabe hipster glasses. Instead I'm writing this post while squinting at a 45 degree angle at my laptop, wearing my "mom glasses." I say "mom glasses" because these glasses are basically the style equivalent of mom jeans. On top of it all, one of the babies knocked 'em to the ground so they have a giant scratch across one of the lenses. Hence, the squinting. It wasn't supposed to go down like this. Toward the end of last year, I came across a Facebook ad for these super cute glasses. The glasses were artfully perched on a stack of hardcover design books on a rustic wooden coffee table. There was a vase with pretty pink peonies half visible in the frame. Oh, and there was a giant coffee mug in the picture. It was like the glasses were calling my name in that perfectly styled picture! And so, I became one of those suckers that clicked on the FB ad. It seemed like a great idea. I'd pick five frames, they'd ship them to me, I'd try them out, pick one, and they'd send me a pair of glasses. Tada! Bada bing bada boom! Except well, weeks later, still no glasses. No wait, they did send me a pair of glasses but I would have to wear them on my forehead because the prescription was literally centered at the bottom of the frame. And all this AFTER they made me take a picture of my face and send it to them so the could presumably center the prescription to match my eyes. Clearly, the folks there are cackling for successfully pulling a fast one on me. For the record, do you know how hard it is to take an unblinking picture of yourself, while standing in a quicksand pit of Legos with two babies trying to scale your legs like it's a rock climbing wall? Add in the dark undereye circles and the crazy hair pulled back with a 1980's tie dyed scrunchie and well, you basically have your new Facebook profile picture. You can thank me later. I kept my bruised and beaten down vanity in check and sent that picture off to a bunch of well rested, trendy hipsters because it was apparently critical. Except it appears all they did was smirk at the "Gah! A baby is biting my ankle" expression and go back to growing beards, rocking flannel shirts, and not making my glasses. Thankfully, my current pair of specs is still in sorta service and I made these Curried Cauliflower Fritters as an awesome consolation prize. Inspired by Ottolenghi's fritters, I basically kicked up the spice level a bit and continued my serious love affair with curry powder. These were so good, we didn't even bother to put them on a plate and instead ate them as soon as we pulled them out of the pan. Half way through, we blitzed together some garlic, cumin seeds, and Greek yoghurt to make a fantastic creamy yogurt dip and it basically took the fritters to a whole new level. Now this isn't breaking news or anything. You fry something and it's delicious but I should add that frittering and frying vegetables does help to assuage the guilt a bit. And also this recipe isn't cauliflower specific. I've made these bad boys with broccoli, potatoes, and the sleeper hit, sweet potatoes and they've all been delicious. Now, if anyone asks, I've barricaded myself at home and am rocking my mom glasses while stalking the mailman. Thank god I've got me some fritters to keep me company. Boil cauliflower in a pot of water until florets are soft. While cauliflower is boiling, in a separate pan, heat 2 tablespoons of oil and fry onion until light brown. Add garlic and fry until garlic is golden. 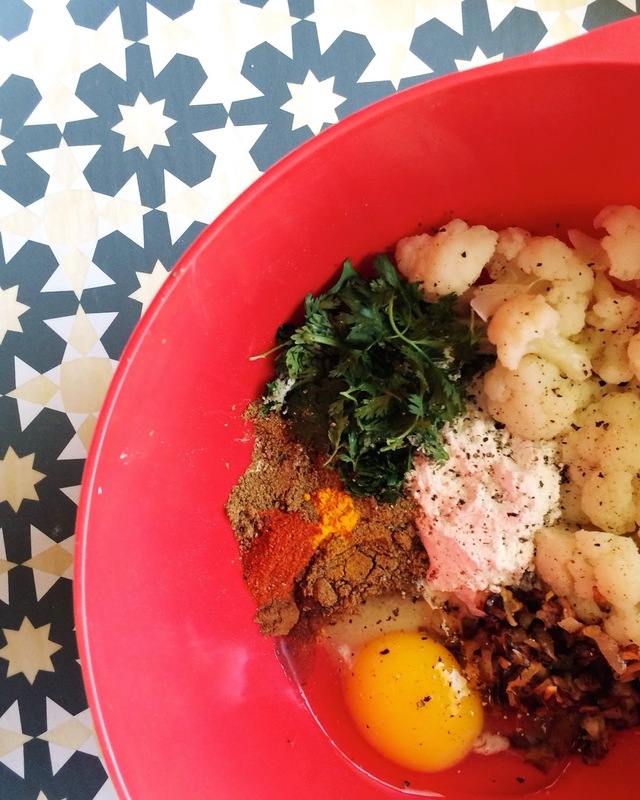 In a large mixing bowl, mix flour, cilantro, eggs, and spices and whisk to make a smooth batter. Add the warm cauliflower. Mix, smashing the cauliflower into the batter. In a large pan, heat 1/2 inch of oil over high heat until very hot. Working in batches, spoon in the cauliflower mixture, allowing 3 tablespoons per fritter. Fry fritters until golden brown. Serve with yogurt sauce (or if you're the Hubster, with ketchup). Adapted from Yotam Ottolenghi's Cauliflower and Cumin Fritters. I love this recipe, and ps: I almost did the same thing..thanks for the warning!! Yikes, sorry about your glasses! Hope you get a new pair that fits soon :) These fritters look fabulous! I love all the spices in here and they sound perfect with the yogurt sauce! Thanks Kelly! They're fixing the wonky pair so I'm hopeful they'll be better this time around. Thanks for making me laugh and for sharing this delicious recipe. I hope there is a happy ending to your quest for glasses; keep us posted! I also love the chance to use my curry powder and I would hardly wait to plate these before eating as well. Given the cauliflower, these fritter are definitely virtuous. : ) I love the yogurt dip and would alternate with ketchup (since I love me some ketchup!). Omg I'd love to see a picture of you with your new glasses! Selfie time! Oh sorry about the glasses love. These fritters look so very good though. I'm sorry about your glasses experience - how frustrating!! Haha. I bet these fritters sure made you feel better though - they look divine! I'd like to say BOOO to the company you're working with--they had one job to do!!! But at least you had some fritters as consolation--I am of the belief that anything Ottolenghi or Ottolenghi-inspired makes for a good day automatically. Wow.. the whole recipe looks yum .. can't wait to try it today . Mmmm... those fritters sound so good. Even though I'm not a huge cauliflower fan... but these don't sound like they would taste too "cauliflowery" if that makes sense? As for glasses... oh man I'm CONSTANTLY on the hunt for the right pair! !